- secured, cloud-delivered, ent.-wide, info tech. mobility solutions, Purch. Agr. by U.S. Health & Human Svcs., Max. $47.5M Award Over 5-Yrs. - a leading provider of mobile satellite voice and data services, to Present at Cowen & Co.'s 42nd Annual Technology, Media & Telecom Conf. They say, "sell in May and go away". This seasonal sell-off effect appears to have happened early again for metals and mining stocks, which sold off in March after a brief run up earlier this year. With gold prices still sluggish and flat at around $1,300/oz., metals investors must be wondering where to find cover going into the Summer Doldrums when gold demand is lower. I keep coming back to uranium as both a beaten-up metals play and as the world's key energy solution for the foreseeable future. Don't get me wrong I'm also a fan of renewables such as solar and wind power, but there are just too many reasons why these technologies will take too long to meet even a meaningful amount of the world's current energy demand, let alone future needs. In the meantime we still need to get off of expensive, inefficient, depleting and dirty fossil fuels. In our growing world, nuclear power is the only practical solution to bridge the energy supply gap. This also positions uranium miners as one the greatest long-term investments. Many fear or don't understand nuclear power based solely on media sound-bites, often sponsored by fossil fuel industries or misinformed environmental lobbyists. This article focuses on the many interesting facts to outline the importance of nuclear power and the timeliness of uranium related investments. Nuclear reactors have been reliably supplying electricity to our power grids for 60-years. The world has 434 operable reactors, 72 under construction, 173 planned and 309 proposed as of April according to World-Nuclear.org. As the number of reactors doubles by 2030, so will the demand for uranium. Uranium is a metal which produces massive amounts of energy. Nuclear fission results from uranium-235 being bombarded with neutrons in a reactor, causing the U-235 atoms to break up and release huge amounts of energy. While uranium is as common as tin or zinc, only concentrated deposits are economical to mine. The largest uranium deposits are in Australia, Kazakhstan, Canada and Russia. Uranium does not trade on a futures exchange and you cannot hold it like gold. There are companies like (TSX: U) Uranium Participation Corp. that invest in uranium oxide in concentrates and uranium hexafluoride, but it now trades at a 9% premium to its net asset value instead of the usual 7% discount to NAV seen over the past few years. The only way to play uranium for potential maximum leverage to higher U3O8 prices, earnings and dividends is uranium mining stocks, like the one mentioned later. Uranium is radioactive, which is why uranium mining is the most heavily regulated type of mining. Uranium mines take longer, cost more and are more difficult to start new or existing mines. Even with all these barriers the U3O8 spot price is only $28 per pound, where it was 9-years ago. As demand starts to double, how long can this price stay down almost 80% from its $137/lb. peak in 2007? Compare this to oil which topped $140 per barrel in 2008, crashed to $40 during the recession, but is now $100-$110depending on your country. The price of uranium has not recovered even though oil causes massive pollution and has only a small fraction of uranium's energy density. A U.S. power plant that supports a city of 1-million people needs: 9k tons of coal, or 40k barrels of oil, or less than 7-lbs. of uranium. This works out to around $600k for coal, $4M for oil, or $200 for U3O8, per day. Unlike coal, oil and natural gas power plants that can switch fuels in response to higher commodity prices, nuclear power plants do not have a commercial fuel substitute. However uranium prices are inelastic, and even if U3O8 went up tenfold electricity rates still might not have to increase as fuel costs are not nearly as significant as capital costs to build and maintain a nuclear power plant. Instead of toxic chemicals and smoke, reactor stacks produce steam and leave virtually no carbon footprint. Nuclear power is far cleaner than coal and oil, and most nuclear by-products can be reused as energy. Any remaining waste can be safely stored and takes up little space. All the nuclear waste the U.S. has ever produced would fill one football field about 4-feet high. The U.S. has the world's largest nuclear fleet with 100 operable reactors, 5 under construction, 5 planned and 17 proposed. The government realizes the benefits of nuclear energy and has guaranteed many billions in nuclear power plant loans, such as the Vogtle nuclear complex expansion in Georgia. Emerging nations from India with 21 reactors and 63 in the works to South Korea with 23 reactors and 11 in the works all need nuclear energy to power future generations. It's interesting how oil rich nations like Russia with 33 reactors and 59 in the works, to Middle East nations such as the UAE with 14 in the works, to even Saudi Arabia with 16 reactors proposed, all want nuclear power. Lots of sun and wind there, but the push is for nuclear energy! The real growth story for nuclear power and uranium is China, with 20 operable reactors, 29 under construction, 57 planned and 118 proposed. That's 224 potential reactors, which works out to more than half of the world's current operable reactors in just one country. Why the scramble for so many nuclear reactors? Because it's the most efficient way to produce commercial amounts of electricity. More than 15 countries already get 25% or more of their electricity from nuclear reactors. Compare neighbouring countries France and Italy with similar populations of around 60-million. France gets around 80% of its power from nuclear, while Italy has no nuclear power. Is it a surprise that France is the world's largest net exporter of electricity, while Italy is the world's largest importer of electricity? In less than a decade global uranium demand, mostly for nuclear energy, will increase from 170Mlbs. to around 260Mlbs. per year. The world currently mines less than it consumes, and for the past 20-years has depended on recycled uranium from Russian warheads to fill the supply gap. This HEU program ended in 2013, removing 24Mlbs. per year, forever. Many large uranium mines have closed and expansion plans have been cancelled due to low U3O8 pricesmost are not economical until prices more than double. When this happens it will still take years to start these mines again. As uranium prices soared a decade ago, hundreds of new exploration companies focused on uranium. It was not uncommon then to see a company receive a market cap of $50M+ after adding uranium to its name and acquiring some prospective U-dirt. Most of these companies are now trading for pennies a share with little to show for their efforts. These zombie stocks can't get financed and will die or get renamed with their share structures rolled back, which is almost as bad. In the 1990's they would have morphed into Dot-Coms, today marijuana plays are the craze. My point is that management focus and experience is very important, and that needed exploration for future uranium supplies is way down. This all points to severe supply shortages that could last for years. 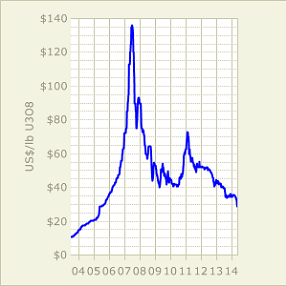 Uranium prices are already known for their extreme spikes, as you can see from the 10-year U3O8 price chart below. The chart shows the first U3O8 price spike starting at $10/lb. in 2003, which progressively runs higher over the next four straight years until it peaks at $137/lb. in 2007. This works out to a 1,270% gain before crashing with oil and other energy prices going into the recession. 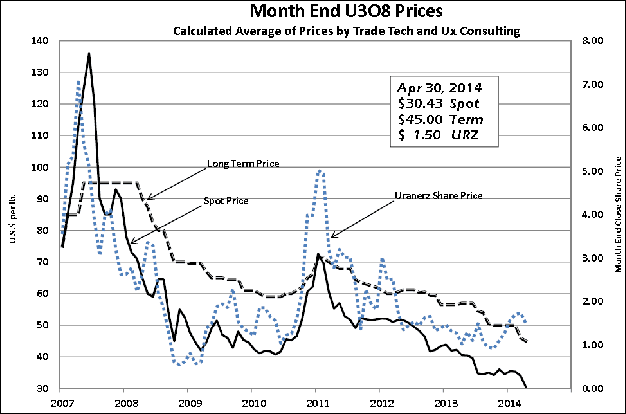 The second U3O8 price spike starts in 2010 at $40/lb. as the economy and oil prices start to recover. However, less than a year later uranium's run is cut short at just over $70/lb. as a result of the nuclear plant accident at Fukushima Japan. Three years later U3O8 prices are down almost 60% today. I believe the accident at the Fukushima Daiichi nuclear plant could and should have been prevented. The plant was over 40-years old and there were urgent upgrade warnings for years. The backup power failed to shutdown the reactors when needed, which escalated the situation. Newer generation reactors are safer and have gravity fed water coolant systems that work without the need for any power. Japan's record 9.0 earthquake and tsunami tragically resulted in over 19,000 deaths, mostly from drowningnone of these deaths were from radiation. As for the nuclear accident in Pennsylvania 35-years ago, to quote the WNA, "there were no injuries or adverse health effects from the Three Mile Island accident". The worst nuclear accident was Chernobyl in 1986 with 30 confirmed deaths, "the product of a flawed Soviet reactor design coupled with serious mistakes made by the plant operators". Compare this to over 100,000 deaths in the 20th century from coal mining accidents in the U.S. alone. This does not include the many thousands of deaths and illnesses each year from breathing polluted air, nor the toxic effects on our water supply and to the environment. Oil and even natural gas are just as bad, from the dangers of Fracking and regular pipeline accidents to the Exxon Valdez and Gulf of Mexico BP oil spills, to the train derailment at Lac-Megantic Quebec last year that claimed 47 lives. All types of energy come with a cost to human, animal and environmental lifeincluding renewable energy. Although nuclear energy is likely safest on a deaths per unit of energy produced basis, and there are more reactors in the works today than even before Fukushima, U3O8 prices remain below the cost of production for most uranium miners. A third U3O8 price spike can't be that far away! Timing catalysts to a turnaround event can be tricky, which I expect as the media reports on Japan restarting the first of its 48 operable reactors. Several reactors have already been upgraded and with recent energy policy changes in Japan this points to possible restart announcements anytime now. With the world's third largest fleet of nuclear reactors restarting, and Japan buying U3O8 instead of selling its stockpiles, investors on the sidelines for three years may wake up and rush in all at once. A lot of money was made by investors during those first two uranium spikes. Fukushima has created a situation for a third spike, with the U3O8 price now 30% lower than where the previous spike started. With higher demand as supplies move lower, the uranium price spring is coiled very tight right now! As of mid April, (AMEX: URZ)(TSX: URZ) Uranerz Energy Corp. commenced In-Situ Recovery (ISR) uranium mining operations at its wholly-owned Nichols Ranch project, which is strategically located in the prolific central Powder River Basin (PRB) of WY, USA. Wyoming provides over 80% of the nations uranium production, and the nation's largest U3O8 processing plant is in the PRB. ISR is a low cost mining method that is ideal for sandstone-hosted uranium deposits, like those found in the PRB. Wells are drilled and groundwater fortified with benign oxidizing agents is pumped into the deposits to dissolve the contained uranium. This water and uranium solution is then pumped to the surface and processed into yellowcake. ISR can be profitable at even low U3O8 grades as it requires minimal labour, no heavy mining equipment to move or crush rock, and it's environmentally safe. Uranerz Energy controls one of the largest PRB land positions with around 80k acres, which are surrounded by major uranium producers such as (NYSE: CCJ)(TSX: CCO) Cameco Corp.see PRB Property Map. These two companies have a history as Uranerz' predecessor, also called Uranerz, was bought by Cameco in 1998. Today they have a toll processing agreement for Uranerz' uranium to be trucked to Cameco's nearby Smith Ranch-Highland plant for final processing. In December, Paul Goranson joined Uranerz as President, Chief Operating Officer and as a Director; prior to this he executed Cameco's Double U growth strategy in the PRB as President of its U.S. subsidiary. The United States finds itself in a precarious position as the world's largest uranium market requiring over 50Mlbs./year, while producing less than 5Mlbs./year. With no more recycled Russian HEU available, URZ and shares of other U.S. based U3O8 producers may start to command a premium as the U.S. government and markets support domestic uranium miners in the name of energy security. URZ joins an elite group of only six publicly-traded, uranium-focused producers worldwide. Uranerz' first mine is starting production as most analysts are calling for U3O8 prices to make the turn this year and move much higher from there. Uranerz also has the safety of having sales agreements in place with two major U.S. utilities, which were signed when uranium prices were significantly higher. Nichols Ranch is permitted for up to 2Mlbs. per year and will supply these premium off-take agreements first, and then ramp-up production from there as U3O8 prices start flying again. The chart below overlays month-end U3O8 spot, term and URZ share prices from 2007 to April 2014. As you can see, all three prices correlate fairly well. As the U3O8 spot spiked to $137/lb. in 2007, URZ shares soared to over $7. As U3O8 ran to over $70/lb. prior to Fukushima in 2011, URZ ran to almost $6. In 2007 Uranerz was exploring to establish a NI 43-101 U3O8 resource. In 2010 and early in 2011 the company had completed funding and was waiting for permit approvals to build a mine. Today, the spot U3O8 price is only $28/lb. and URZ is back to $1.35 per share, a market-cap of USD $116M. The difference this time is that Uranerz has completed the difficult, decade long process of exploring, permitting, financing and constructing a mine. With the stage now set for a third U3O8 price spike, Uranerz Energy now produces uranium and anticipates its milestone first-sale soon.